Are You In For The NPR Student Podcast Challenge? 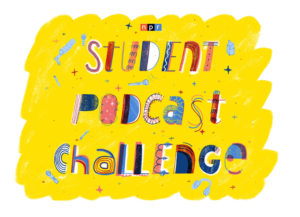 Did you know that NPR is running their first-ever student podcasting contest?! What do you have to do to participate? Have students produce a podcast that is 3-12 minutes long. Contest entry closes on March 31, 2019. You can get all the eligibility details and the submission form and guidelines here. Whether you are planning to submit a podcast for the challenge or have just been thinking about getting started with podcasting in your classroom, there are many easy ways to get started. Anyone with access to a mobile phone or computer can create a podcast seamlessly. This means that the necessary tools are in the hands of students. Podcasts can be a vehicle for students to explore their passions and find their voices, and the creative process fosters ownership of learning, develops higher order skills, and deepens understanding. Another comprehensive resource is this webinar, “Creating Podcasts in Class,” where our CEO (who is a former broadcast journalist) walks through the process of podcasting in class with a teacher, Mike Godsey, who shares insights from the classroom. This recording offers great tips for before, during, and after podcast recording, as well as authentic examples and reflections from a teacher who podcasts with his students. Lastly, as you and your students are thinking about potential topics on which to focus original podcasts, you can invite them to listen to some of these great student journalist podcasts to spark ideas: Teen Girls and Positive Social Media Messages, Promposals, and Growing Up A Single Mom. You can find additional student podcasts in our list of Youth Radio stories. Any of these story formats could work for this podcast contest. Happy podcasting! For more, check out our other blog with further resources for the NPR Student Podcast Challenge.